If you’ve been wanting to try VapeWild or simply a new vaper looking for some affordable priced e-liquids to try to see which flavors you enjoy the most, then you’ve come across the best place on the web! With our VapeWild Coupon, you can get $16 off and get some e-liquid for only 1 buck! Get their welcome sample pack, which includes 4 30ml bottles (120ml total) for only $1 with free shipping! 1. Reveal coupon code above and copy it to use later. 3. Once you get to their website, we highly recommend creating an account with them. This will allow you to easily track any orders you make, save your shipping and/or billing information, and just makes the checkout process much quicker. 5. The first thing you want to do after you create an account, check out their welcome sample pack. You can get 4 samples which each come in a small 30ml unicorn bottle, a total of 120ml for only $1 using our discount code. 6. Select the flavors you want alongside the blend and nicotine strength and add it to your cart. 7. If you’re looking to grab more e-juice or some hardware, they’ve got you covered. VapeWild has a ton of different flavors available in various different sizes, blends (VG/PG ratios), and nicotine strengths. In addition, they have a great selection of hardware for both the beginner and advanced vaper alongside a wide variety of accessories for your mods or tanks. 8. Once everything is added to your shopping cart, click on the shopping cart icon where it says "My Cart" and click on "View Cart". 9. On the cart page, double check you have everything you want in there. We always recommend this as it only takes a few moments and can save you some hassle in the future. 10. Now that you’ve double checked your cart, it’s time to apply the coupon. On the bottom right hand corner, you will see your subtotal with more information below about your order. One is the coupon box, simply click on "Add Coupon" to the right and paste in the coupon code from before into the box. Once done, click on "Apply" and you’re done! 11. Tip - They do currently offer free shipping on US orders over $39.99, this is something we highly recommend taking advantage of anytime your shopping here. You can save up to an additional $10 in shipping charges. VapeWild was first launched quite a few years ago with the goal to see people live and live well. They’re dedicated to changing people’s lives while providing the lowest cost possible and being able to accommodate smokers to make the change to vaping. Not only this, but they strive to provide outstanding customer service, ensuring they stand out to their customers. Vape Wild offers over 150 unique flavors with various different blends and nicotine strengths, catering to pretty much all vapers, no matter the vaping style. They do carry nicotine salts, disposable e-cigs, hardware, apparel and over 25 different brands to make sure they provide the customer with not only great support and customer service, but an amazing selection that can’t be found elsewhere. Although the vape industry continues to evolve and change each year, VapeWild aims to deliver and set the bar even higher. No matter if you’re looking for cheap e-juice or hardware, VapeWild is sure to have the vaping gear you need. Even though VapeWild has over 150 different flavors available plus a variety of other brands for hardware and premium e-liquid, there are certain products they carry that we think are the best. Here are our top products from VapeWild. The Horizon Falcon Sub Ohm Tank is one easily one of the best sub ohm tanks on the market today and the great thing about this atomizer is that there are different versions available. Thankfully, VapeWild carries all of them, so you can pick and choose which color combination you like which is perfect if you like to match your mod and atomizer. What makes the Falcon Tank so great is the coil head system. It’s unique in regards to what its composed of, and delivers unmatched flavor. In addition, the last much longer than your normal replacement coil heads, which is always a good thing since you’ll be saving more cash down the road. No matter if you’re looking to flavor or cloud chase, the Falcon is definitely one checking out, it will deliver one of the best vape experiences you can get from a tank that uses replacement coil heads. Next up is the Aspire Nautilus AIO Pod System. The name Nautilus might ring a bell as it’s a name Aspire has used before on previous products, and these said products are rated some of the best in their respective categories. The Nautilus AIO Pod System is an easy to use starter kit and it’s a great choice for either the beginner or expert. Two great features of this device is its large 1,000mAh internal battery and continuous output wattage of 12w. With this large of a battery, you can get through all of the work day with no issues. Now, with 12w continuous power, you’ll experience a consistent vape, which means every time you take a vape, it’ll always be the same satisfaction. What’s even better is that this kit comes with 2 different coils, one designed for Nic Salts while the other is designed for regular e-liquid. One of our favorite e-liquids from VapeWild is Murica, which also happens to be one of their best sellers. It is described as a bomb pop flavor with notes of red cherries, tart lemon lime, and blue raspberries and that’s pretty much what it tastes like. It vapes smoothly and we enjoy vaping it in both tanks and drippers. Like all other VapeWild flavors you can choose which blend you prefer, nicotine strength and the bottle size. When you find a favorite, you can grab a total of 480ml for cheap! If you enjoy fruit flavored vape juices, then definitely give this one a shot, you might just find your new all day vape. If you’re still looking to shop and want more coupons, then we have a list of three other similar brands you might want to check out with exclusive codes. The first on this list of other similar brands is Vista Vapors. Similar to VapeWild, they literally have hundreds of different flavor options where you can choose your preferred blend, nicotine strength and bottle size. In addition, they carry various hardware for both the experienced and new vaper. They also have an excellent bundle that includes everything you need to start vaping which is the perfect present to a smoker wanting to quit. Our discount code will save you 10% off the entire website! Now if you’re looking for a larger selection of premium e-liquid, then look no further than Breazy. They carry over 1,400 different premium brands, making it one of the largest selections available online. Not to mention, they carry various hardware brands as well with new discounts coming in almost everyday. Our exclusive promo code will save you 10% off anything on their site with free shipping on US orders over $50. If you’re in need of some new hardware and want some heavy discounts, then be sure to check out MyFreedomSmokes. They have a solid clearance section with both newer and older products and it’s constantly being updated. In addition, they stock new products weekly, and put them on sale right as they go live on their website. Our coupon code there will provide you 10% off your order. 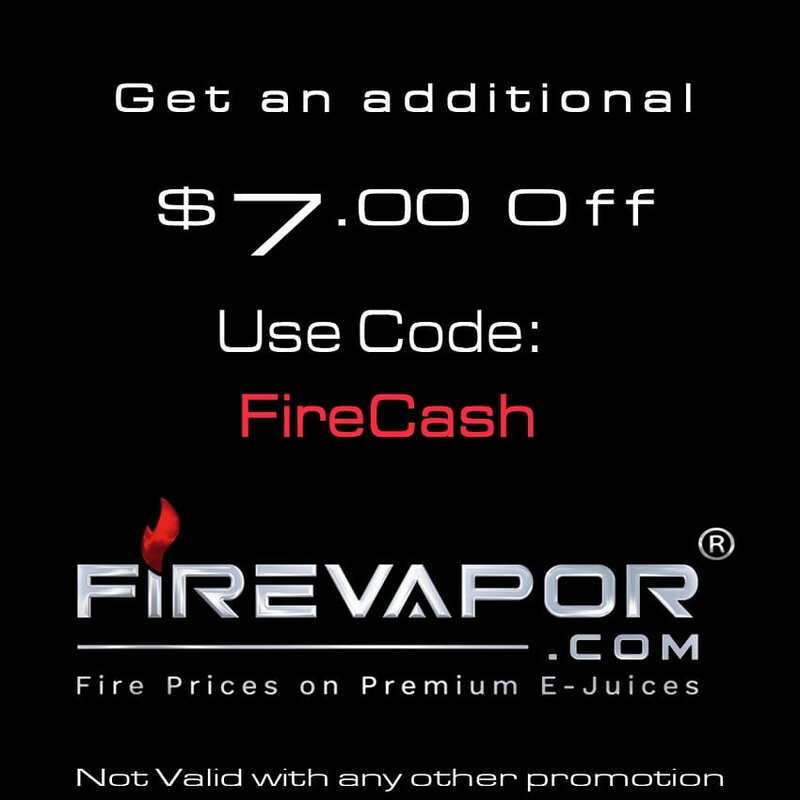 Can I Use This VapeWild.com Coupon More Than Once? The provided coupon code for VapeWild to get $1 e-juice is valid for new customers. Are There More Vape Wild Coupons Available? We will continue to update this page with any new coupon codes for Vape Wild. In addition, we will list any expiry dates or if there are any restrictions for each code provided. To contact VapeWild Customer Service, simply click on "Customer Service" at the top of any page on their website. Once you are on this page, you can submit a ticket to reach their email. There is also a phone number available if you prefer to chat with them over the telephone. When you place an order, you will first receive an email notifying you of the recently placed order. After your order ships, you will receive another email letting you know your order is on the way with tracking details. You can also log into your account and check your order status and grab any tracking information from there. Does Vape Wild Offer Free Shipping? Yes, free shipping does apply to US orders over $39.99. Is International Shipping Available At VapeWild? Yes, VapeWild does ship worldwide. How Much Money Can I Save Using The Vape Wild Coupon Code? With the provided coupon code on the welcome sample pack, you’ll save over $15! In addition, you’ll get free shipping as well, saving you a couple more bucks, for a grand total savings of nearly $20!